Stencils with varying thickness in specific areas are referred to as Step Stencil. In order to accommodate PCB’s with both standard and fine pitch technology as well as Paste-in-hole components, Steps are chemically etched into the squeegee side of the stencil (step up) or (step down) to increase or decrease the volume of paste. All paste apertures are laser cut. In order to achieve optimum results it is imperative that consideration is given during the design phase of the PCB in order to accommodate limitations of the printing process. Stencils with areas etched away to accommodate labels, pealable masks, tracks or filled vias are referred to as Relief Stencils. This process can assist with improved gasket seal and minimize damage to the stencil and squeegee. It can also be used in conjunction with Step Stencils. Intrusive reflow is fast becoming a cost effective method of assembling PCB’S with both Surface Mount and leaded components and connectors. Several factors may affect the result and therefore consulting with our engineering staff to ensure that the stencil meets all your printing requirements is essential. For additional information or a quote contact our engineering department at stencils@lstec.co.za. Epoxy glue is used to secure Surface Mount Devices to the PCB prior to the wave soldering process. Glue dot dispensing machines are costly and use up valuable floor space whereas Glue Dot Stencil printing utilizes existing technology and process equipment to print the entire board in a single wipe. Glue Dot Stencils have the ability to deposit Dots of varying heights depending on the aperture size and stencil thickness. Unlike paste stencils where it is desirable to transfer the entire contents of the aperture onto the PCB, the surface tension between the epoxy glue and the Glue Dot Stencil drags the adhesive until separation occurs. It is this dragging action relative to the aperture size and stencil thickness that determines the Dot Height. PCB Inspection Templates are an inexpensive and reliable method of carrying out in-line inspection of assembled boards. The operator simply places the appropriate template on the top or bottom side of the assembled board to reveal missing or misplaced components. This method is particularly useful to carry out after a reel change or after a stoppage to ensure that errors have not been introduced by the operator. When ordering an inspection template you will need to supply all the relevant Gerber Data and a fully populated board. Delivery takes place within 3-4 working days. LST laser cut repair stencils allow you to quickly and accurately rework and replace BGA’s and QFP’s. Simply apply flux and solder paste onto the pads of your PC boards for replacement of faulty components and solder joints. Repair stencils are cut according to your specifications and can be supplied with an appropriate size mini squeegee. LST can assist you with design rules related to your stencils. At Laser Stencil Technology we have the ability to produce same-day prototype precision metal parts for product design verification due to our expert engineering and full CAD department and LPKF – YAG laser equipment. We can handle both small and large volume orders and should your product be especially price sensitive, we have a separate metal etching department which can produce your high volume parts to a slightly lower specification. LST can work directly off your mechanical drawings to create the cutting data and produce the prototype for approval within 24 hours. 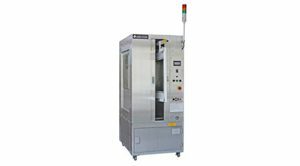 There is no expensive tooling which can take months to produce and needs to be continually maintained, only to become redundant when the design changes. Lstec specializes in the photo etching process (also called photo chemical etching) allows us to produce intricate metal components with close tolerances that are impossible to duplicate by other production methods. Photo etching eliminates the cost of hard tooling, improves design flexibility, and shortens lead times while eliminating burring and stress problems. There are two methods employed by LST for producing RF Cans. The first is to laser cut stainless steel with perforations along the folding lines and then Nickel plated to provide a solder-able surface. This method is more costly but is extremely accurate and small volumes can be produced quicker than the alternative. The second method is to chemically etch brass sheet with folding lines on one surface only for ease of bending. Tin plating is an optional surface finish which improves solder-ability and protects the brass from tarnishing and also offers an enhanced aesthetic appearance. The quantity and required date of delivery. Whether parts are to be supplied in sheet form or separated. Parts to be folded or supplied flat. RF Can data supplied either in Gerber or DXF format or PDF drawing. The pneumatic frame is a four sided stretching frame for fast clamping of SMT metal stencils. Simple fast and repetitive changing of stencils is provided by patented perforation or profile. A unique patented system of stretching with compressed air enables perfect tensioning all over the work area. Air is disconnected after setting the stencil to the frame. Various thicknesses of stencil can be used and perfectly tensioned for print application. Additionally, the frame provides constant tensioning and therefore constant print quality over time. The functioning of the frame is very simple and therefore reliable. Unlike other tensioning systems, Vectorguard is not air pressure dependent. This means that tensioning is simple and automatic, independent of traditional pneumatic assistance processes. The Vectorguard system features an extruded aluminium guard, securely attached to each edge of the foil using interlocking moulded plastic corners. The enhanced safety and rigidity this offers means that you can now retrieve, tension and adjust the foil with absolute confidence. Mounting the foil in the Vectorguard frame system takes only a matter of seconds – requiring little training or physical effort. Easy to set up and compatible with virtually any modern platform. Vectorguard eliminates the need for complex alignment procedures. Foil tensioning is both accurate and automatic, guaranteeing you perfect repeatability even by the most inexperienced operators. 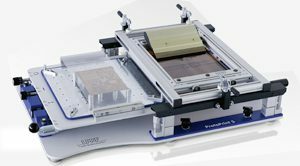 The Proto-Printer was specifically designed and manufactured to enable our customers to assemble their prototype PC Boards in a professional manner and as close to the method used for the production volumes. With high technology fine pitch devices, it is essential to have vertical/horizontal separation of the stencil from the board for optimum paste deposit. This is achievable with the Proto-Printer together with fully engineered and laser cut stencils. With no frame or mesh and mounting costs, the Proto Stencil price can be kept to a minimum and turnaround from placing the order to dispatch of the stencil can be the same day if necessary. Click the clinks below to view PDF’s.